Blog Quick Quotes: CHA Sneak: One Fine Day + Samba Giveaway!!! CHA Sneak: One Fine Day + Samba Giveaway!!! Who enjoyed the CHA Sneaks for "Summer Samba"?!!! Ready for the reveal of the entire collection and get some Samba in your Ramba? We are warning you, this is a happy maker! Excessive smiles, whistling or general frolicking and silliness that could occur from viewing this collection! coordinating embellishments in approximately one week! Who would like to win this cheerful, fun and fabulous new collection? 2. Leave a comment on this post for your entry! Additional entries can be earned by commenting each day through Friday, midnight pst! Who's ready for our next CHA Sneak? You are in for a treat because that is what we have in store for you next!!! "Precious Memories of Family are Forever!" Hi everyone! 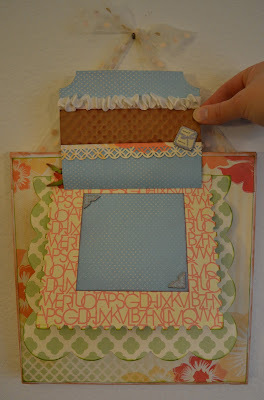 Lisa here today, hosting the blog to kick off our "One Fine Day" collection with an off the page inspiration for you! Today I am showcasing an all new paper line by Quick Quotes called "One Fine Day." With these papers, I decided to create an interactive home decor piece. 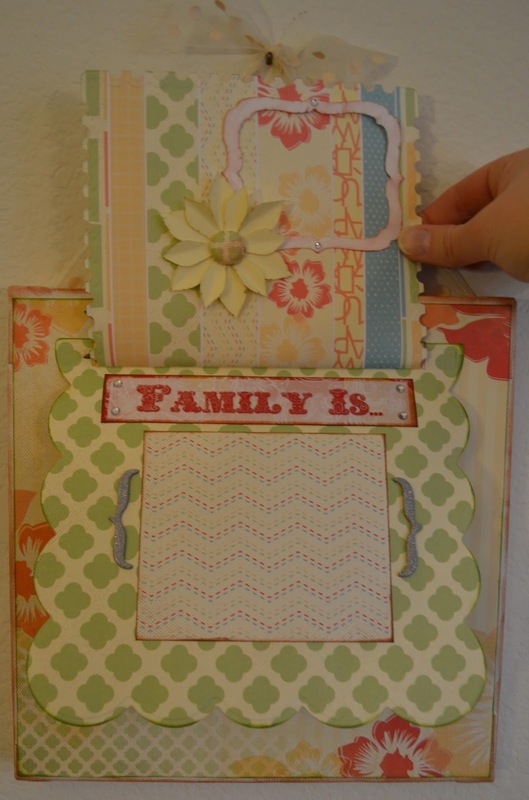 I used my Spellbinders Grand Caliber machine along with the Creative Book Pages Grand dies to create my flip up pages. On the cover I added corrugated chipboard, a Petaloo flower, QQ frosted butterfly, cream ribbon & I cut the Precious Family rectangle from the word & phrases sheet included in the paper line. 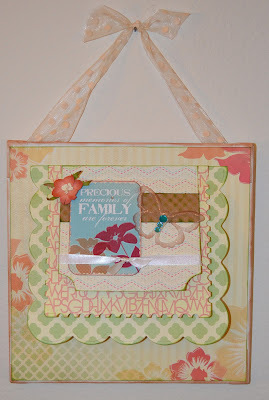 Throughout the project I also used various QQ inks: Mocha Mama, Green with Envy & Bloody Mary. For my first flip up pages I used some corrugated chipboard, a Martha Stewart Punch & some of the Quick Quotes adhesive backed glitter chipboard pieces. I then scrunched some ribbon across one part of the page. For these next pages I used a QQ diecut frame. I also used more of the glitter chipboard pieces and added various bling. 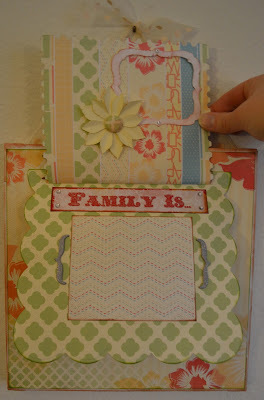 "Family is..." also cut from the word & phrases paper. 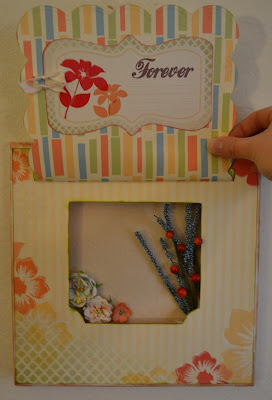 For the last pages I used the negative piece from one of my flip up pages as the background to mat around my shadow box. I decorated the inside with Petaloo flowers. 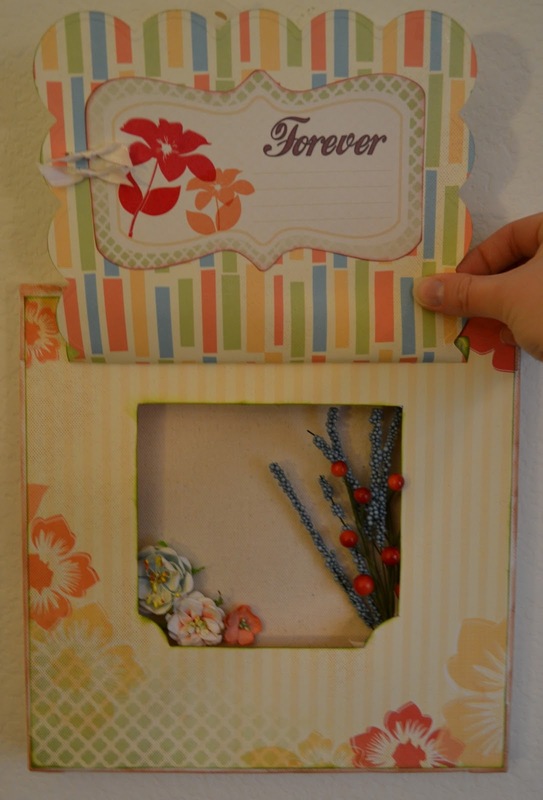 The 'Forever' journaling spot is also included on the 12x12 word & phrases sheet in the paper pack. I really enjoyed working with these new papers and I hope you enjoyed my project. What a beautiful and creative project Lisa! along with your Grand Calibur to make your project interactive! is our Trendy Tuesday - Tip of the Day! Canvas is such a fun medium to work with! If you'd like to see even more projects showcasing canvas, please email rhonda.quickquotes@gmail.com and let us know! Wonderful shadow box. Like teh colors. Thanks for giveaway chance. Samba is wonderful... My DH and I try to cruise or go to a tropical destination yearly, and I am always looking for new collections to scrap with. This fits the bill! Thanks. I would love to put some Summer Samba in my Ramba! Lisa, love your project and the new One Fine Day collection. Can't wait to see more of this one too. Love the new line and wonderful projects! Great job on the shadow box. The papers are so fun and bright. 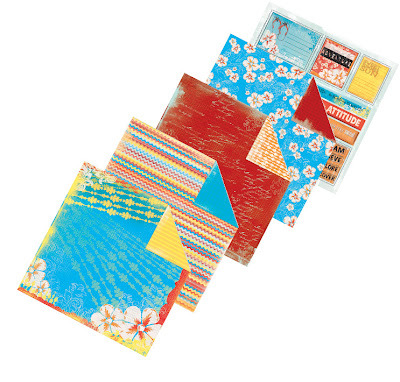 I an soo ready for spring, and would love this paper to start some fun spring cards. What a great decor album! Love that idea! Your right the Summer Samba is very happy paper. Love the calendar Lisa with the new One Fine Day. What a cute idea and more gorgeous paper. I feel a hole in my wallet coming on. What a neat way to use a canvas. Great project. Love the new line and the Summer Samba. Can hardly wait until it's available. what a bright, cheery collection. thanks for the chance to win. I seriously love this! It is a burst of summer in the middle of winter! Wow, what a lovely!!!! creations with so many little hidden treasures. Gorgeous Papers, too!!! Beautiful collection and gorgeous project ! What a lovely project with all those flipping layers and gorgeous papers. And Samba, with those bright colours, looks so hot on a dreary January afternoon. What an adorable wall hanging! I love the Summer Samba collection, definitely will be picking that up! Great project! Love the fun paper! I love these papers! Such vibrant fun colors! Fantastic project! I'm already a follower on Google Reader, but I also connect via GFC and subscribed for email, lol! I want to make sure I don't miss anything! Lisa's project is amazing! But then she never disappoints!! This really IS happy paper! LOve the bright colors and summery (is that a word?) designs! Great project, Lisa! Summer Samba is gorgeous....it definitely is a "happy maker"!!! You guys never let us down with your new lines!! I love both of the new collections and the canvas project is really cute. This project is wonderful! I love how it's like opening a present with each new layer, thanks so very much for this new idea! And thanks for the chance to win! I just love that shadowbox!!! Another to go on my "to make someday" list :) And Summer Samba is so bright and fun...makes me wanna grab a margarita and soak in the sun!! All of these sneek peeks are fabulous! Each line just keeps getting better! Thanks for a chance to win! beautiful. lovin the new line! I get to go to Hawaii for my special birthday this year and would this do the job for scrapping.